Two civilians and 14 insurgents, including three Taliban commanders, were killed as NATO-led troops "mistakenly" hit a car in southern Ghazni province on Saturday, an official claimed. The airstrike took place in the Asfandi village on the outskirts of Ghazni City, the provincial capital, said the governor's spokesman, Fazl Sabawoon. Seven of the civilians injured included two women and a child. The official repeatedly called the raid unintentional, explaining the target was a group of rebels trying to ambush security forces in the area. Civil Hospital Director Dr. Baz Mohammad Himmat confirmed receiving eight wounded people, including two women and a child. Two of them are said to be in critical condition. An area resident said the civilians were heading to the city when they came under attack. 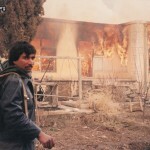 He rejected the presence of insurgents in Asfandi at the time of the incident. In response to an email from Pajhwok, ISAF confirmed the airstrike but denied civilian casualties. “The air attack killed 12 terrorists,” the NATO-led force said. 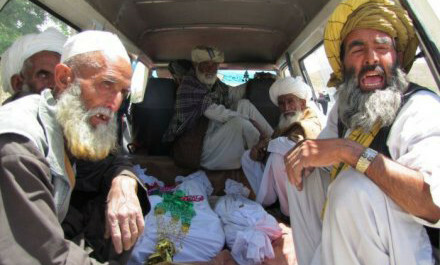 But resident Ahmad Gul said five civilians and nine Taliban were killed in the bombardment. The civilians were heading to the city when they came under attack. The raid followed a Taliban assault on a convoy of foreign forces, he added. Wounded in the incident, 15-year-old Ahmad Jan said: “The Taliban stopped our vehicle and one of them embarked. All of a sudden, there was a strike that left me unconscious.” Of the five passengers in the car, three have been missing, presumably dead, he added. The Taliban, meanwhile, acknowledged the loss of eight fighters and injuries to five others. The group’s spokesman, Zabihullah Mujahid, claimed killing 20 policemen and destroying six of their pick-ups. He said a dozen civilians were among the dead. Broadly, in 2012 there were 363 civilian casualties in Afghanistan  or about 30 per month  that were attributed primarily to unexploded ordnance, though in some cases also to mines.